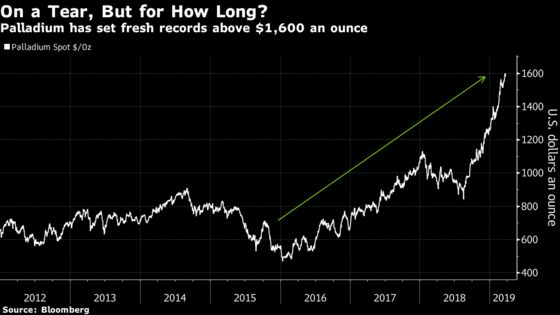 (Bloomberg) -- Palladium has been one of the hottest commodities for a while now, but analysts think this year may be the time to book profits. Palladium’s in an eighth straight annual shortage, helped by stricter emissions legislation around the world. Above-ground stockpiles dropped about 40 percent in eight years through 2018, consultant Metals Focus Ltd. estimates. But there are signs of weakness from China, the top car market, where passenger car sales fell 17 percent last month. The rally has spurred speculation that users may start switching to platinum, which is cheaper and has similar properties. 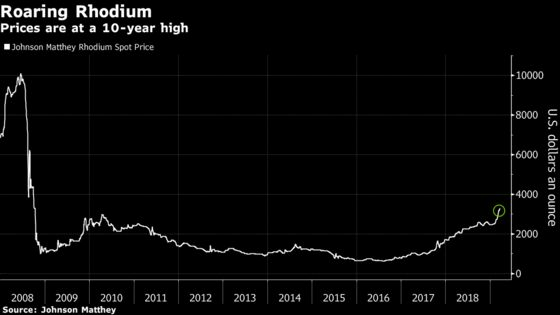 Palladium may fall to about $1,350 an ounce by year-end, down from $1,583 now, according to the average estimate of nine analysts surveyed by Bloomberg. That would wipe out much of the 25 percent rally so far this year. Three analysts expect prices to end the year higher than now. Analysts are mixed on the outlook though. Two surveyed by Bloomberg see prices falling by year-end and two expect further gains. Capital Economics Ltd.’s Ross Strachan is among those who remain cautious.